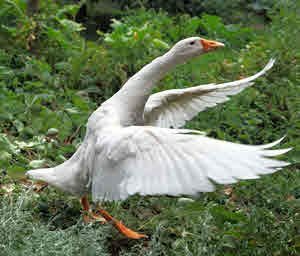 Anyone with a spare area of grass, such as a field, meadow or orchard, could do worse than consider keeping a few domestic geese. They will keep the grass down, provide large eggs for eating, cooking or decorating, as well as grace the table of the discerning. Finally, there are no finer ‘watchdogs’ to deter prowler. It is a common misconception that geese are vicious birds that will attack and bite. In fact, unless they are scared or provoked they tend to be incredibly docile birds. They become very attached to their owners and often people find the geese they raised for meat end up as the family pet due to their affectionate nature. Geese have long lifespans and they can live for up to 40 years! Having said that, there are times, such as the breeding season, when a gander can be aggressive. Even to those who feed the flock. It is here that it is necessary for the feeder to try and imprint the notion of ‘I can be aggressive too, so back off!’. Making a ‘goose-head and neck’ shape with the hand and arm in front of the gander and moving it up and down like a gander threatening, can be effective. A mixture of wheat and pellets is the best combination for feeding geese. The wheat should be given in a large bucket of water as this makes the wheat more digestible for the geese and also prevents vermin getting at the wheat and the pellets should be given in a deep bowl that is protected from rain/damp. The food should be freshened daily so you should just put out as much as your flock will eat in a day, which if they don’t have access to large grass areas, will be between 140 – 200 grams (5-7oz) per day per goose. 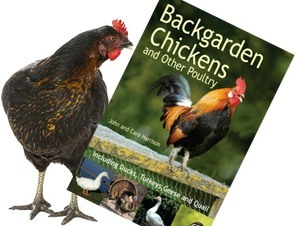 As with all other poultry you should provide grit so that the geese can properly mill the food in the gizzard/crop and the grit also adds calcium to the diet.